Editor’s Note: The Government Work Report released on March 5 has charted a course for China’s economic development for this year. By setting fairly robust growth targets, the country is set to be the locomotive pulling the world economy amid global economic headwinds. A number of pro-growth efforts have been unveiled to spur innovation and continue opening-up. The country has also released the Foreign Investment Law to better protect the rights of foreign business in China. China Daily polled senior executives from multinational corporations to understand their positioning, perception and predictions of the Chinese market. 1. The year 2019 marks the 70th anniversary of the founding of the People’s Republic of China. What in your opinion are China's biggest achievements to date? What are the biggest achievements made by your company so far? China has made remarkable achievements with 40 years of reform and opening-up. Now it is the world's second-largest economy, with the world’s manufacturing powerhouse and the second-largest healthcare market. Novartis is proud of being a major partner of China's journey of reform and opening-up by expanding our footprint, fostering local talents, driving innovation and sustainable development in the past 32 years since our entry to Chinese mainland. China is one of the most strategically important markets for Novartis. With four core businesses, three major manufacturing sites, and two R&D centers here, we are now even better positioned in this dynamic market. 2. China’s economic growth moderated to 6.6 percent last year as it shifted its focus to high-quality growth. How does your “China strategy” fit into the new trend? China’s shift from “Made in China” to “Created in China” is set to benefit many companies, especially those in pharmaceutical sector with innovation as their lifeblood. Novartis is one of today’s most innovative companies with total R&D expenditure amounting to $9.1 billion last year, and we are committed to being a major partner of China’s new journey to build an innovation-powered economy. And we are proud of playing a part in accelerating the digital transformation of China’s healthcare sector by embracing the digital technologies including big data and artificial intelligence, and combining our pharmaceutical expertise. 3. What are your views on the Foreign Investment Law? How will China’s ongoing efforts to further open up the economy and protect the legitimate interests of foreign companies help your business in China? China’s business environment has been continuously improving while the Foreign Investment Law marks a new and bold step by China to provide pre-establishment national treatment to foreign investors, and create a more open, transparent and predictable environment for investors. 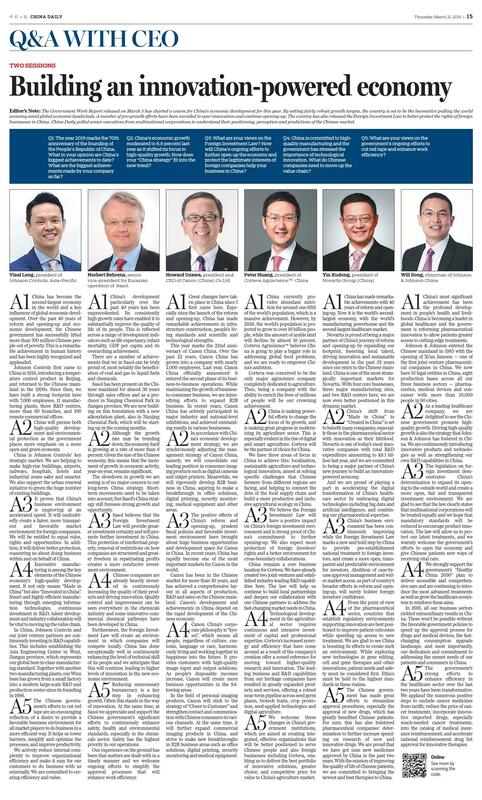 Abolition of case-by-case approval management and wider market access, as part of country’s broader efforts in reform and opening up, will surely bolster foreign investors’ confidence. 4. China is committed to high-quality manufacturing and the government has stressed the importance of technological innovation. What do Chinese companies need to move up the value chain? From the point of view from the pharmaceutical sector, countries that establish regulatory environments supporting for innovation are best positioned to improve patient outcomes while speeding up access to new treatment. We are glad to see China is boosting its efforts to create such an environment. While exploring new technologies in gene editing, cell and gene therapies and other innovations, patient needs and safety must be considered first. Ethics must be held to the highest standards in these realms. 5. What are your views on the government’s ongoing efforts to cut red tape and enhance work efficiency? The Chinese Government has made great efforts to streamline approval procedures, especially the approvals of new drugs, which has greatly benefited Chinese patients. For sure, this has also bolstered pharmaceutical companies’ determination to further increase spending on research of new and innovative drugs. We are proud that we have got nine new medicines approved by China in the past two years. With the mission of improving the quality of life of Chinese patients, we are committed to bringing the newest and best therapies to China. The article is excerpted from "Building an innovation-powered economy," originally published in China Daily on March 21, 2019.